If you have an afternoon to spend in leisurely pursuits of the completely unproductive kind, go on google and search as many different modifiers as you can to the word “shoe”: Shoes in history, bizarre shoes, shoe houses, shoe cartoons, new shoes, old shoes, even a timeline of shoes. A “shoes in politics” search will indubitably result in some of our favourites, with the famous George Bush shoe attack and Nikita Khrushchev’s shoe-banging incident topping the list. Can’t say we have never felt the same – many are the time that throwing a good-sized boot would have given some relief and smacking a 4-inch stiletto on the dinner table would surely calm surly guests bringing out-of-control festivities to a quick end. Type in those four little letters on the keyboard often enough and by the time you are finished you may wonder why it is spelled like it is and google that leading to another slightly more educational pop-up. They are everywhere: when they aren’t keeping our feet from the elements, they are populating our hallways and cupboards, overtaking the streets, multiplying in stores and luring us from magazines, posing in books and being immortalized on the web. Footwear has staked its claim in history. This fortnight, the Two Cents Tuesday Challenge theme – Shoes – shows us that a pair of shoes cross all cultural borders and can even help us learn more about each other. “What do your shoes say about you?” – Are they practical and sturdy, coquette with a heel,the pair that won’t be thrown out or a baby’s first, memories of your own or being put into someone else’s, wellies, waders, golfers with spikes, mountaineers, runners, ugly ones no one likes… We would love to see your vision. I always wondered how they get up there because it’s no easy feat! Must be one of those middle of the night endeavours… Thanks for entering. 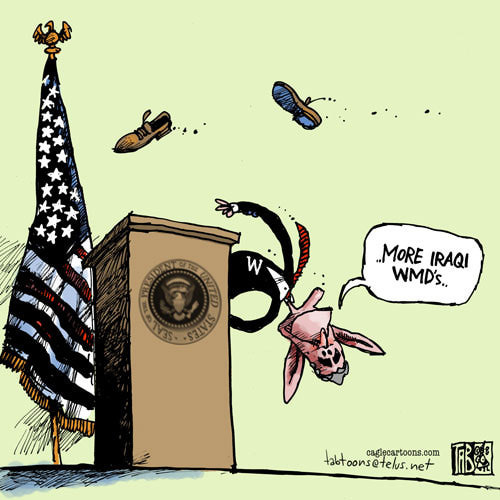 “More Iraqi WMD’s..” :D Ha,ha great stuff! Oh gosh, somehow I forgot to do my “shoe” homework assignment–will get crackin’ on it later today. Put your comfy slippers on to give you some added inspiration! Don’t have any–this is a barefoot gal! But that provides plenty of inspiration, so we’re good. I love being barefoot too but our winters are just tooooo cooooolllldd….. I have a lot of neuropathy in my feet, so I don’t feel much cold–or anything. Now I know for sure how well-grounded you are! Thanks for your entry! You’re so welcome–for some reason, your challenges are the easiest for me. Maybe we’re just on similar wave lengths all the time? Well thank you – it’s a very particular frequency! My own Miss Z has it in her fingertips – is there a cure?